I recently received the March Hip Kits and I had to play along with the challenge in the Hip Kit Club Facebook Forum. This week’s challenge was a sketch designed by Ashley Horton. I started by grabbing 3 photos that closely matched the colors in the kit. 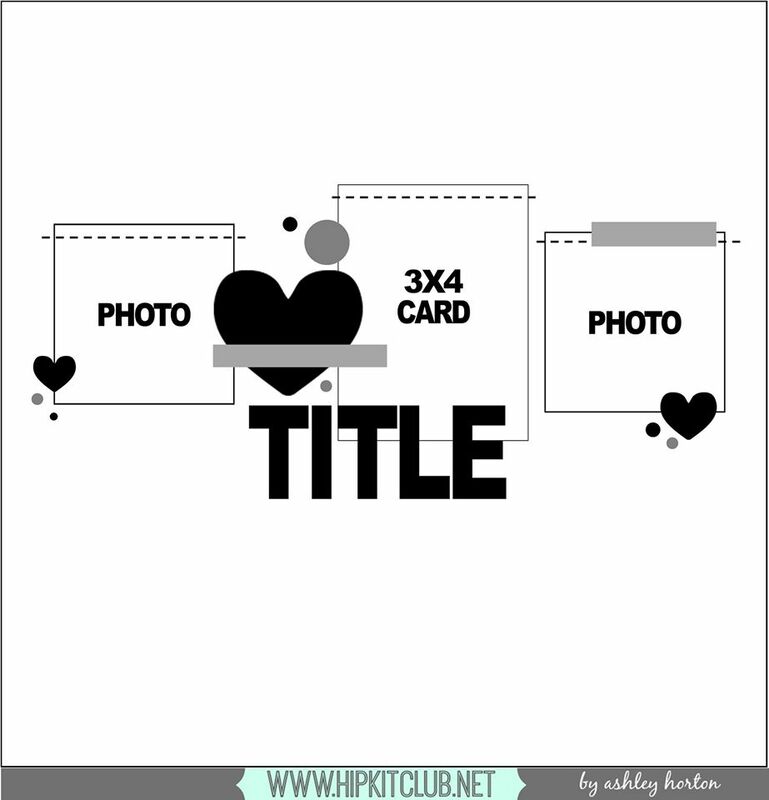 I paired them with a 3×4 card from the Project Life Kit that also serves as my title. I added green hand stitching around the PL card to give a little added definition to the card. 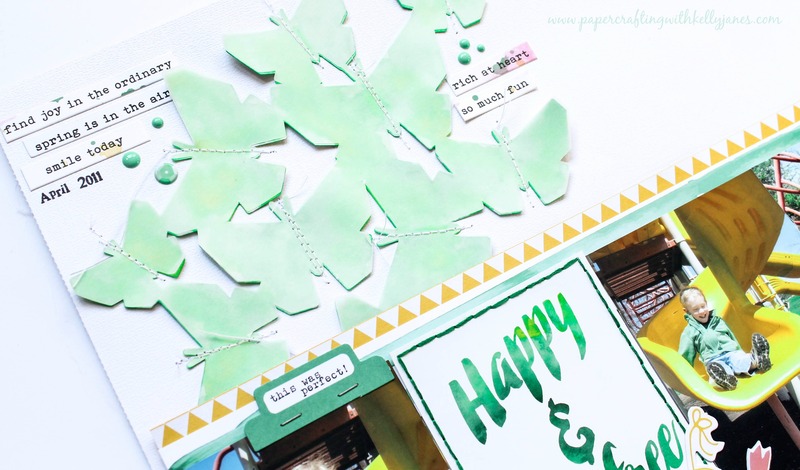 I added a layer of green striped paper that is exclusive this month and then the yellow triangles are from a Pink Fresh Studio paper included in the kit. Once I had my photo cluster arranged I cut the exclusive butterfly cut file on watercolor paper. I then used the Shimmerz Aqua Huez from the Color Kit to paint them a vibrant green color. When I laid the butterflies onto my white cardstock they were a little too bold so I cut the file again in vellum and added a layer of stitching. After I had the photos and butterflies down I started adding Pink Fresh tiny word stickers, puffy sequin stickers, Basic Grey enamel dots, Pink Fresh wood veneer hearts, and other ephemera available in the Main Kit, PL kit, and Embellishment Kit. The date is stamped using a retired date stamp from CTMH. 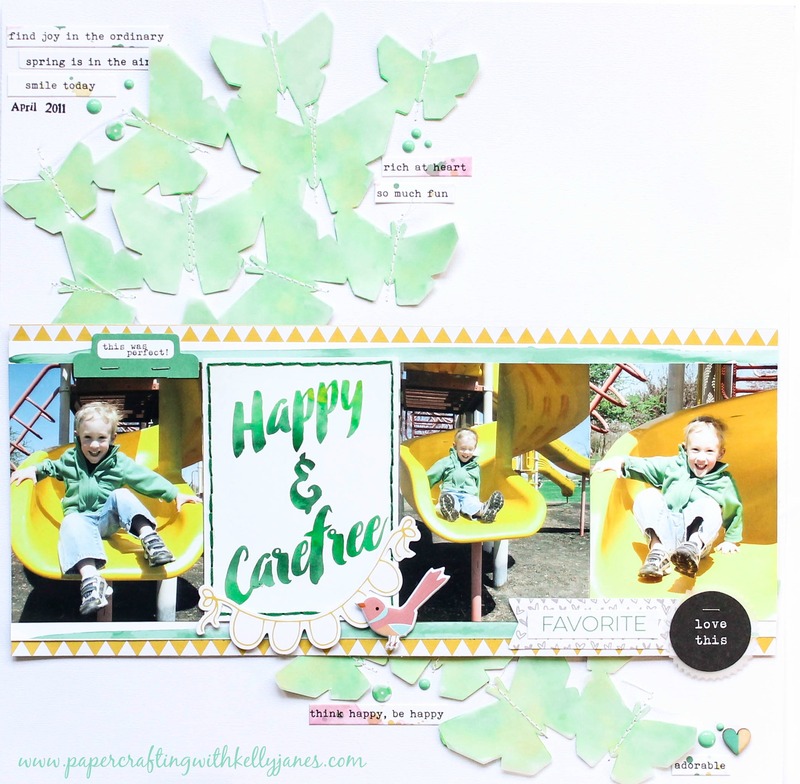 I didn’t really feel journaling was necessary for this layout because it was just a fun day at the park. One thing that strikes me now is how much Aidan has grown. We were recently at this park and it is just mind boggling how much he has grown and changed in such a short time frame.